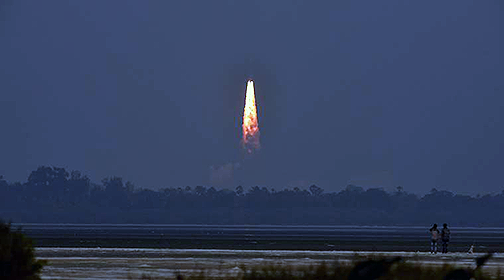 The Indian Space Research Organisation (ISRO) has launched India's latest communications satellite — GSAT-29 — aboard the heavy lift rocket GSLV-MkIII-D2 from Sriharikota — the launch occurred at November 14, 2018, with a 27 hour countdown and the rocket lift off occurring at 5:08 p.m., local time. The GSAT-29 satellite. Photo is courtesy of ISRO. The satellite was injected into orbit 16 minutes after lift off. 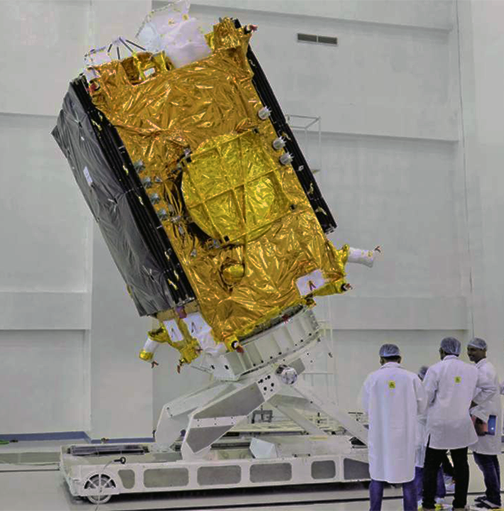 The GSAT 29 is suited with Ka- and Ku-band high throughput transponders to provide communication services to India's remote regions, such as the northeast of the country and Jammu and Kashmir. With a mission life expectation of 10 years, the satellite will also provide support for the Digital India program and carries several new technologies for testing. The GSLV-MkIII D2 mission carrying high throughput communication satellite GSAT-29 takes off from Satish Dhawan Space Centre, in Sriharikota. Photo is courtesy of ISRO. The GSLV-MkIII-D2 is a three-stage launch vehicle with two solid strap-ons, a liquid core stage and a C25 cryogenic upper stage, which is more efficient and more complex than solid and liquid stages. This was the 67th launch mission from the Satish Dhawan Space Center at Sriharikota and the 33rd communications satellite built by ISRO for this fifth launch of 2018. The head of ISRO, K. Sivan, said that the organization was extremely happy to declare the success of the nation's heaviest launcher lifting the GSAT 29 from Indian soil. While the launch vehicle's first operational mission was going to be Chandrayaan in January of 2019, this vehicle is going to carry humans to space three years from now.